The Real Alfred E.: The Real Alfred E.
In 1954, Mad Magazine artist Harvey Kurtzman plucked a postcard from a bulletin board in a colleague’s office that featured a boy (or was it a man) with a goofy, gap-toothed grin and uttering the two-part, fatalistic, rhetorical question, “What? Me Worry?” The image itself was not new; Kurtzman was familiar with the image as one associated with “funny picture postcards in Times Square penny arcades and tourist traps.” After several minor appearances in the magazine, Norman Mingo’s full-color re-imagining of the postcard image appeared on the cover of Mad Magazine #30 in December, 1956, replete with the “What, Me Worry” catch phrase, assuming his rightful position as trademark and cover-boy for Mad magazine. But where did that image originate? For years, legions of books, websites, and online forums have debated and analyzed the origins of the image. The upshot of all the discussion was, basically, that Alfred E. Neuman is a copy of a copy of a copy of an image that bounced around for decades in various guises - political buttons, silly postcards, ads for painless dentistry, and Nazi anti-semitic propaganda posters. No one could identify the image that started it all, although some people suggested that the image evolved from a tradition of cartoonish and racist depictions of Irish immigrants from the mid- to late-19th Century America. 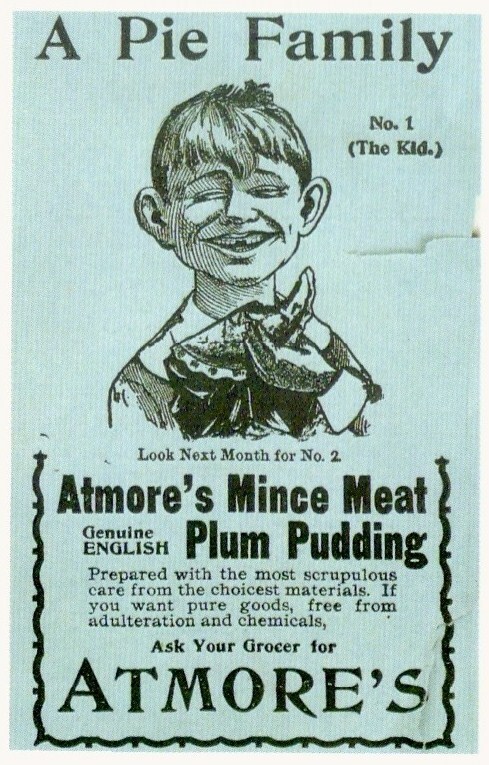 Until now, the the earliest known, fully Neuman-esque image has been “The Kid,” a member of “A Pie Family,” who appeared in a print advertisement for Atmore’s Mince Meat and Genuine English Plum Pudding. The advertisement appeared in the New York edition of the Illustrated London News and McClures magazine in 1895. 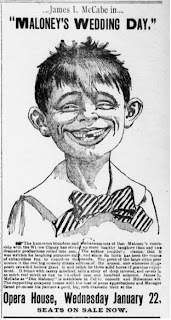 Although some earlier, pre-1895 cartoon images seemed to bear some resemblance to Alfred E. Neuman, those images are not presented in the head-and-shoulders, frontal view and do not show a missing tooth. Alfred E. Neuman did not only inherit his good looks from this image; he also inherited his devil-may-care attitude and his penchant for political satire and pop culture parody. From its first days, The New Boy captured and expressed all of the familiar visual and comedic qualities of Alfred E. Neuman. That The New Boy would mature into a NeuMan was fate, kismet, destiny. The New Boy image depicts the play’s title character, Archibald Rennick, who is enrolled as the ‘new boy’ in school. The image displays all of the familiar visual characteristics of Alfred E. Neuman, a head-and-shoulders frontal view, a boyish face, an incongruous Adam’s apple, a wide grin with missing teeth, lazy eyes, tousled hair, big ears and a coat and tie. The only real difference is that the New Boy wears an Eton jacket over a shirt with an Eton collar that is folded over and lies outside of the jacket collar. Alfred wears a more conventional collar tucked inside of the jacket. 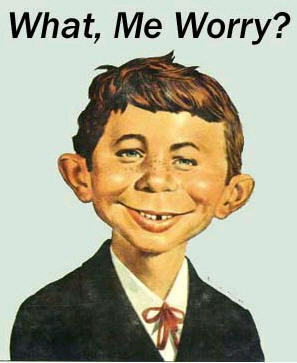 Like Alfred E. Neuman, The New Boy image is paired with a slogan that conveys the mood expressed by his facial expression. The New Boy’s two-part, fatalistic, rhetorical question, “What’s the good of anything? – Nothing!”, similar in tone and format to Neuman’s What? Me Worry? catch phrase. Although Neuman’s slogan is now generally not hyphenated, it was hyphenated when it first appeared alongside a full-sized Alfred E. Neuman on the cover of Mad Magazine in December 1956. The postcard from which Mad borrowed the image also used a hyphen in the phrase. It must have been a perfect storm of artistic achievement by the producer, the actor, the wardrobe designer, the playwright and the poster artist that captured an image that has resonated with the public for more than a century. The New Boy was a farce comedy about Archibald Rennick, a small, young-looking, thirty-year-old man who is married to an older, matronly widow with a fourteen-year-old son. They are down on their luck, Archibald having lost his nest egg in a bad investment in ‘dry champagne’ company. As the play opens, he and his wife are on their way to visit the headmaster of a school on the hopes that he will offer her a job as matron of the school. The headmaster, one of Mrs. Rennick’s former suitors (and her first cousin, once removed), does not know that she has remarried and mistakes Archibald for her son. He also demonstrates his devotion to his former paramour by promising to will his estate to her on the condition that she never remarries. In order to save her job prospects and her potential inheritance, they maintain the fiction and enroll him in the school. Archibald, the ‘new boy’ in school, is hazed by his classmates and romanced by the young daughter of one of his teachers. Hilarity ensues. When it opened, The New Boy was considered a progressive form of farce comedy, in the vein of the more well-known Charley’s Aunt that had just opened the previous year. Charley’s Aunt also takes place at a school (a university), involves a widow (Charley’s aunt), mistaken identity (she’s not really Charley’s aunt) and champagne (real champagne). The aunt is actually Charley’s college chum in drag, posing as Charley’s rich, widowed aunt. The ‘aunt’ is supposed to distract Charley’s and his roommate’s sweethearts’ chaperone while so that they can get some quality time with the visiting girls. Charley’s Aunt enjoyed long-term international success, including a film version with Jack Benny in the title role. It is still performed regularly. The New Boy, on the other hand, has not aged as well; almost all traces of it have completely disappeared. Only its iconic advertising image survives in the guise of Alfred E. Neuman. The New Boy was an immediate success when it opened in London on February 28, 1894, where it ran for fourteen months. The play inspired Mad-Magazine-like satirical jabs at authority figures even before the show came to America. The New Boy was still a big hit in June of 1894 when His Highness Prince Edward of York (the future King Edward VIII of England) was born; the English press reportedly referred to him jokingly as The New Boy. The joke would return to haunt his grand-nephew over sixty years later. Charles Frohman purchased the American rights to the play in March 1894. Charles Frohman and his brothers Daniel and Gustave were some of the most powerful and successful producers in America. Charles Frohman even produced the original production of Peter Pan in London in 1904. In a twist of fate sadly reminiscent of Mad Magazine’s September, 1973 cover art lampooning the Poseidon Adventure, Charles Frohman died in the sinking of the Lusitania in 1915. Charles Frohman produced the original Broadway run and ‘original cast’ tour of The New Boy. Gustave Frohman produced a national tour that began during the original Broadway run and lasted for more than a year. The New Boy opened at the Standard Theatre on Broadway (Sixth Ave. and 33rd St.) on September 17, 1894 with the Englishman Willis Searle in the lead role. Searle had previously starred in a South African production of Charley’s Aunt. The opening was marred by terrible reviews blamed largely on Searle’s poor performance. In his autobiography, Twinkle Little Star, Sparkling Memories of Seventy Years, James T. Powers recounts that Charles Frohman offered him the role on the day after opening night, promising to give him a “big spread in the newspapers and advertise [him] as ‘The New, New Boy.’” When Powers assumed the role on October 9, 1894, The New Boy was “greatly improved” (The World, October 20, 1894) and “a big hit, the first semblance of great success” that would “go like wildfire now” (The New York Times, October 10, 1894). Searle then spent some time touring with one of Frohman’s minor touring companies of Charley’s Aunt, but was back in England by the following July. The Evening World, somewhat cattily (perhaps a lot cattily), reported that Searle was back in England “flaunting before managers eloquent tributes of his success, as set forth by the critics of Memphis, Indianapolis, Dallas, Chattanooga and other eminently literary centres.” That was the last report on Willis Searle that I was able to find. James T. Powers performed the role through the end of its Broadway run in Early December, 1894 and continue performing the role on the ‘original cast’ tour through April, 1895. Bert Coote played the role in the first national tour that started in mid-November, 1894 and continued for more than a year, ending in early 1896. Bert Coote later purchased the rights to produce the play himself. 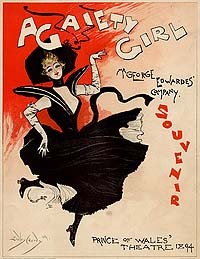 His independent production toured the country through 1899.
. . . comic red-headed urchin with a joyous grin all over his freckled face, whose phiz [(face)] is the trademark of the comedy, is so expressive of the rollicking and ridiculous that the New York Herald and the Evening Telegram have applied it to political cartoon purposes. Thomas C. Platt was himself the frequent target of political cartoonists. A member of the United States Senate, he used his Republican Party-boss influence to sponsor the Anti-Cartoon Bill in the New York legislature in 1897, as aptly lampooned in a period political cartoon; Platt is pictured on the right. I guess he is lucky that he wasn’t around sixty years later to receive the full Mad Magazine treatment. The New Boy poster reproduced above is from Bert Coote’s independent tour. 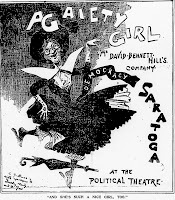 Its resemblance to the newspaper advertisements and political cartoon from 1894, however, suggests that the poster for the original New York production would have been nearly identical. The New Boy advertising image also inspired Mad Magazine-like pop-culture parody, complete with juvenile potty humor and mild sexual titillation. Since there were no movies, as such, and no movie stars in 1894, the targets of the parody were stage plays and the stars of the stage. 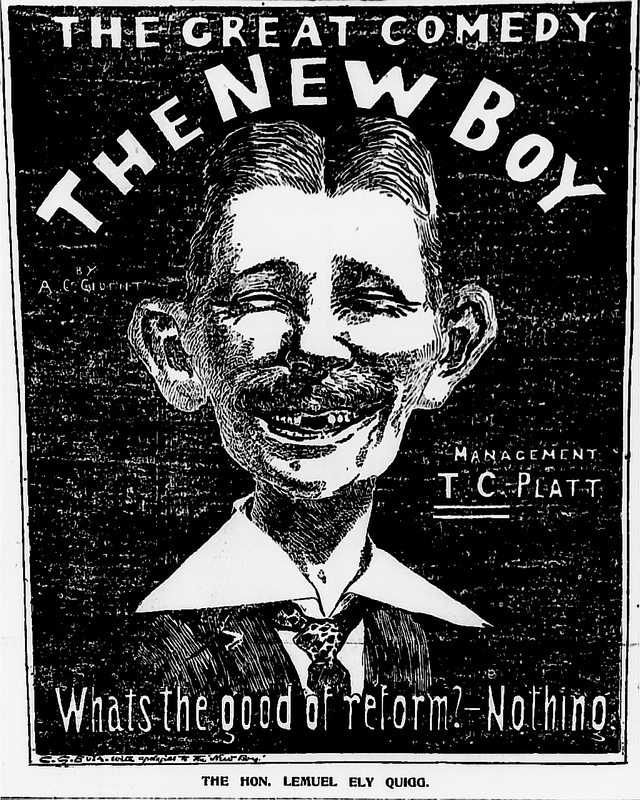 The New Boy poster was featured in a surreal humor piece that appeared in the Washington Times on December 30, 1894, the day before James T. Powers and the ‘original cast’ tour opened in Washington DC. The piece imagines what would happen if the actors or their characters as shown on advertising posters were to come to life after being pasted on a fence. The New Boy is said to be, “in hysterics; nothing but the paste upon his back sustained him from falling down in a dead faint.” When the ‘living picture’ of Venus at the Baths tries to revive him with her towel, the New Boy remarks, "What's the Good of Anything? Nothing!” When another character expresses displeasure with being posted on a fence, “Jimmie Powers” says, “you'll soon get used to it, my dear. . . . For myself, now and then, when the paste has been watered one is apt to get damp sheets. I don't like that, of course, but what's the good of anything? Nothing!" There are more jokes, more characters and actors parodied, all of which might be funnier to people who are more in touch with late 19th Century pop culture and comedic norms, but you get the idea. The New Boy poster and/or newspaper advertisement image would likely have been seen in every city where the show played during its three tours over a span of more than five years. The original Broadway run with Willis Searle and James T. Powers in the lead role lasted for one hundred performances. The ‘original cast,’ with James T. Powers, went on a tour of the Eastern Seaboard and several large, Midwestern cities, including Brooklyn, Williamsburg, Baltimore, Boston, Washington DC, Elmira, Schenectady, Chicago, Detroit and Kansas City. They even performed a brief return engagement at the American Theatre on 42d Street, in the same spot where, decades later, Mad Magazine’s Bill Gaines would remember having seen the “what? – me worry” postcards for sale in tourist traps and souvenir stands. Gustave Frohman’s national tour began in mid-November, 1894 and crisscrossed the country continuously into 1896. The tour performed The New Boy in locations as far flung as Iowa, Utah, California, Minnesota, Wisconsin, Vermont, New York City (uptown in Harlem), Philadelphia, Georgia, Virginia, and Texas, that we know of, and likely many more. Bert Coote’s independent production took The New Boy “north, south, east and west” well into 1899 (The Mail and Empire (Toronto) March 20, 1899). He may have even been performed the show in the new century; the Albuquerque Daily Citizen of November 29, 1899 reported that Bert Coote was scheduled to appear in The New Boy during “the present season.” The three tours visited most, if not all, major cities, many, if not all, smaller cities, and presumably numerous other smaller towns and hamlets across the entire United States and Canada over a five year span. Of the making of theatrical advertisements there is seemingly no end. It is certainly an ingenious thought to purchase a small match factory In Germany and use the matches for advertising a London play. This is what Mr. Perryman, the backer of "The New Boy," has done. Each match-box bears on one side a picture of Weedon Grossmith in a Juvenile sailor suit, and on the reverse an explanatory inscription. The German matchbox connection may explain the reported appearances of the image in a 1909 calendar in Germany, as described in Totally Mad, and on Nazi propaganda posters in pre-war, German-annexed Austria, as described in Carl Djerassi’s article The Quest for Alfred E. Neuman, in which he recounts his emotions upon recognizing Alfred E. Neuman as the face from anti-Semitic posters posted by the Nazis in his native Vienna, Austria after the Anschluss. Charles Frohman may well have used the same match factory to make match boxes promoting The New Boy. It is also possible that Frohman’s production used the same advertising image. I have not done an exhaustive study of advertising posters for the same shows on both sides of the Atlantic, but it appears that at least one other show, The Gaiety Girls, used the same poster in London and New York during the same period. 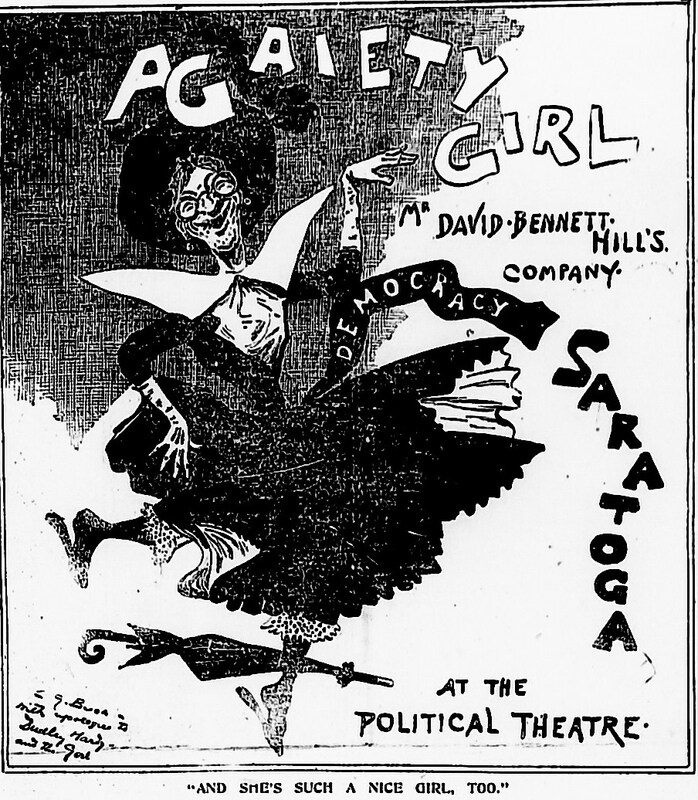 A political cartoon from the New York Evening Telegram of October 1, 1894 (presumably based on a poster for the New York production that was then playing at Daly’s Theater and with which readers would have been familiar) recreates the design and layout of a poster for the London production of The Gaiety Girls. I do not know how common this practice was or whether the American advertising image was the same as the one used in England or not. It is at least a possibility. OK, I know what some of you are thinking. Sure, the New Boy advertising image was funny, and it looks a lot like later images, but was it original? Or is it just one more in an even longer line of imitations or perhaps one more step in evolution of anti-Irish cartoons? The plot and production details of The New Boy suggest that the image is an original, unique image created for the play and not a stock image borrowed from earlier sources and is not an anti-Irish reference. The fact that so many of the other, similar images cropped up soon after the play opened, and none of them before, suggest that the image originated with The New Boy. The pre-1894 cartoon images that bear some resemblance to Alfred E. Neuman may just be random look-a-likes of a funny type, in the same way that Howdie Doodie, Opie Taylor, Richie Cunningham, Ron Howard, Rick Astley and the young Prince Charles looked like Alfred E. Neuman. Let’s face it, red-headed kids with big ears are just funny, a painful lesson that my brother and I learned at a young age, as did our father, uncle and grandfather before us. The main character’s name is Archibald Rennick. The Rennick Family History page on ancestry.com tells us that the name Rennick is most concentrated in Northern England; it is not Irish. Three of the actors known to have played Archibald Rennick, Weedon Grossmith, Willis Searle and Bert Coote, were Englishmen, not Irishmen. Although James T. Powers, whose raised the level of success of The New Boy in the United States, was a third-generation Irish-American, he did not perform in the role until weeks after the original advertising poster was parodied in the Evening Telegram. I have not been able to definitively determine whose image is represented in the advertising images that still survive. In any case, the image seems to have been inspired more by the comedic content of the play and not by any anti-Irish animus. I am not discounting that there may have been a tradition of anti-Irish cartoon images that featured common facial characteristics, I am just not convinced that The New Boy advertising image and its progeny fall into that category. Archibald Rennick is a thirty-year old man who is small enough and young-looking enough to be mistaken for his fourteen-year-old step-son. The age and youthful appearance of the character explain the weird conjunction of the boyish look and Adams apple that first appeared in the original advertising image and persists in Alfred E. Neuman today. 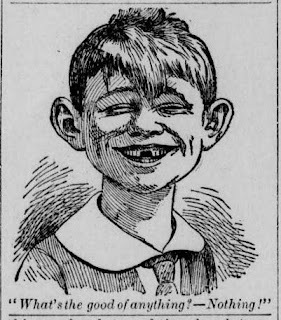 In the original advertising image, Archibald Rennick is shown with two missing, front teeth. Nearly all of the later imitators, including Alfred E. Neuman are missing at least one tooth and none of the pre-1894 cartoons are missing teeth. 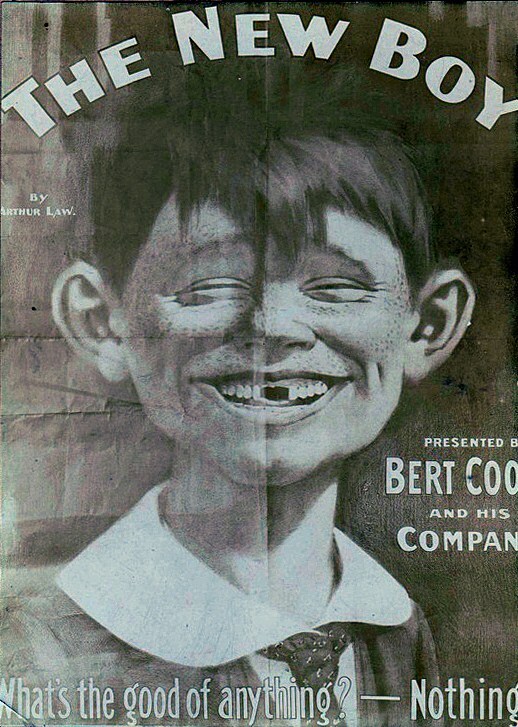 Although the printed version of the play, published ten years later in 1904, does not mention losing teeth or missing teeth, the prominence of the missing teeth in the advertising image suggests that the missing teeth or the loss of the teeth must have been an important element in at least the American production of The New Boy. The story of The New Boy provides several opportunities for Archibald to lose his front teeth; he is forced to play football, hazed by his classmates, and roughed up by his roommate who is described as a pugilist in the script. 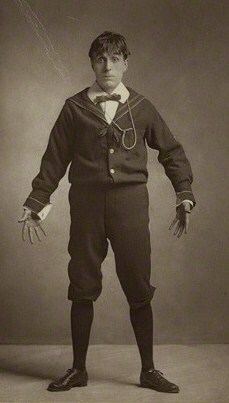 A photograph of Weedon Grossmith from the London production shows the roommate, Bullock, holding Archibald with one hand and threatening him with a closed fist in his other hand, while Archibald shields his face with a forearm. The description of bringing the “wrecks of the rush” onstage seems different from the published version of the play, in which Archibald comes onstage alone. The American production may have included other modifications, including the missing teeth and changing the game from the original Rugby to American football. And kick your front teeth out. Of course, even if he did not lose the teeth in the football game, he lost his teeth somewhere, perhaps during his mistreatment at the hands of his classmates or his roommate. In any case, the feature of the missing tooth seems to have originated with the advertising image for The New Boy. In The New Boy, Archibald wears his fourteen-year-old step-son’s clothing in order to appear more child-like. The script describes him as wearing a ‘boy’s sailor suit with knickerbockers’ in Act II and an ‘Eton jacket’ and trousers in Act III. An Eton collar, traditionally worn with an Eton jacket, is a large, stiff, turned-over collar that is generally worn over and outside of the collar of the jacket (a precursor to the leisure suit, perhaps?). An article on men’s fashion in the Los Angeles Herald (December 16, 1894) reports Eton collars as being in fashion for young men and mentions that sailor suits are “ever-popular” for boys as old as twelve. Photographs of James T. Powers as the New Boy show him mugging for the camera with tousled hair, a cowlick, a silly, wide grin and wearing what appear to be sailor suits. 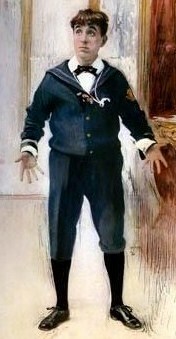 Several photographs of Weedon Grossmith in the role show him wearing a sailor suit and knickerbockers. A photograph of Bert Coote and another photograph of Weedon Grossmith in the role show them in what appears to be the Eton jacket over a shirt with a wide Eton collar worn over the Jacket collar. The photograph of Grossmith is from the back but the photograph of Coote shows him fron the front with a vest and a tie. I am not fashion-savvy enough to distinguish between an Eton collar and a wide sailor suit collar, but The New Boy advertising image may be consistent with either one; it shows at least a wide collar. A close look at the poster version, however, leads me to believe that it is an Eton jacket over a shirt with an Eton-collar, a vest and a tie, similar to the outfit shown in a photograph of Bert Coote in the role. The wide collar is included in many of the early imitators, including the Atmore’s advertisement of 1895, a 1907 Antikamnia calendar, Maloney’s Wedding Day advertisements and many of the ‘painless’ dentistry advertisements. Alfred E. Neuman also has a jacket and tie, but with a more modern shirt collar tucked inside of the jacket. The plot points of the character’s age, the football game or rough treatment (and the attendant missing teeth) and the wide collars all suggest that the advertising image for The New Boy was an original creation made to promote the production and not copied from earlier sources. The lines in the published version of the play are not spoken by the Archibald Rennick, but by the man who, until the Rennicks showed up, had expected to inherit the headmaster’s wealth. He speaks the lines shortly after learning of her imminent arrival, when he realizes that his plans for his potential fortune are going up in smoke. He is worried that all of his obsequious efforts to curry favor with the headmaster over the years may not pay off in the end. Archibald Rennick’s character has similar concerns about past efforts not paying off – he is in financial straits due to his bad investment in ‘dry champagne.’ The American production may even have been revised so that he would speak the catch phrase during the play. The look of the actors who portrayed Archibald Rennick in the American productions also support a finding that The New Boy advertising image is original to the show, and not borrowed from earlier, possibly anti-Irish cartoon images. The Oxford Companion to American Theatre describes James T. Powers as a “small, red‐headed, rubber‐faced comedian . . . with a face quite as grotesque as a gargoyle,” which is consistent with the description of The New Boy as a “comic red-headed urchin with a joyous grin all over his freckled face” and equally applicable to Alfred E. Neuman. James T. Powers was a cartoonish-looking, third-generation Irish-American, not an anti-Irish cartoon. Published images of Powers show a face that looks almost more like Alfred E. Neuman than the original New Boy advertising image. Given Powers’ continued popularity and high profile, it is quite possible that the artists who created the what-me-worry images in the 1910s may have associated Powers’ face with the image and may have, consciously or sub-consciously, modified the facial features to more closely resemble Powers. Powers was a successful actor who toured and performed across the United States almost continuously well into the 1910s. His distinctive face was well-known and often printed in newspapers, magazines, sheet music and who had appeared in the ‘original cast’ tour of The New Boy barely fifteen years earlier. In 1902, his popularity was such that he was featured as the Jack of diamonds in Croddock’s Blue Soap promotional playing cards that featured 53 of the biggest stars of the time. In 1910 he was still popular enough to be featured in the book, The American Stage of Today: Biographies and Photographs of One Hundred Leading Actors and Actresses. Powers was also well-connected in theatrical and artistic circles. He was friendly with Thomas Nast, the well-known late nineteenth century political cartoonist who is credited (or accused), by some, of having drawing several early, racist, anti-Irish proto-Neuman cartoons. He starred in the first production of a play written J. M. Barrie (who later wrote Peter Pan). Powers’ wife, Rachel Booth, was a member of the Booth family acting dynasty and distant relative of John Wilkes Booth. He was also a close friend with the Barrymore acting clan, an acquaintance of Mark Twain, and met the Prince of Wales on more than one occasion. "Little Bertie Coote, aged ten, was a clown – a wonderfully clever little fellow; and Carrie Coote, about eight was Columbine, a very pretty graceful little thing. In a few years’ time she will be just the child to act “Alice,” if it is ever dramatized. . . . Little Bertie Coote, singing “Hot Codlings,” was curiously like the pictures of Grimaldi." 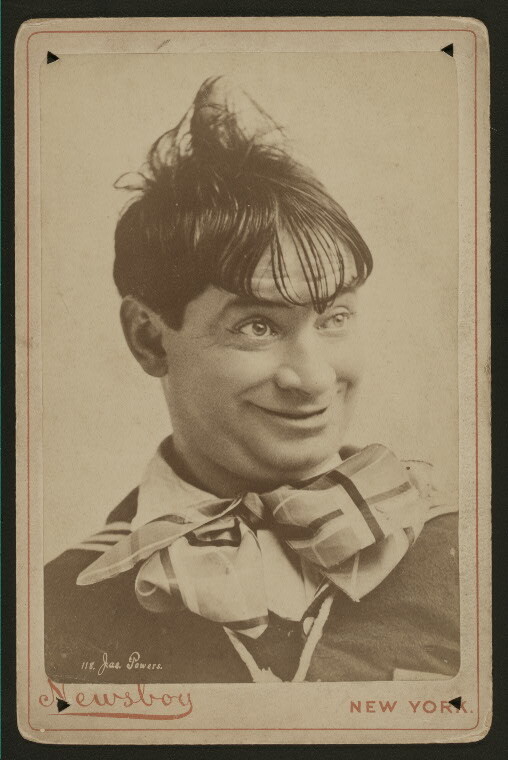 He does not seem to have been as well known as James T. Powers, but he had a long career as a vaudeville performer in the United States and England. He wrote a popular Christmas play for children in the 1920s, The Magic Windmill. He even made a few Hollywood films in the early 1930s. His son, Robert Coote, would have a long career on Broadway and as a character actor in Hollywood films. Black-and-white photographs of Bert Coote show him to have light hair, consistent with red hair. Willis Searle, the first man to play Archibald Rennick on Broadway, is more of an enigma. I have not been able to unearth any descriptions of him or photographs of him. Nor have I been able to learn anything about his career, other than his brief stint in The New Boy and his performances of Charley’s Aunt in South Africa and mid-America. It is ironic, perhaps, that his biggest role and longest-lasting contribution may be completely un-credited; he could well be the face in the original poster for The New Boy. 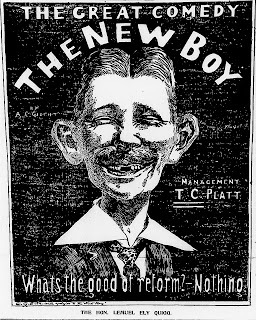 We know that the original The New Boy poster was similar to the poster for Bert Coote’s independent production because the political cartoon published five days after opening night and more than two weeks before Powers first performed the role. Although Powers was offered the role on the day after opening night – and promised a big advertising campaign, what is the likelihood that Frohman could produce a new poster and distribute a new poster in less than four days? The newspaper advertisements, the earliest one of which I could find appeared in The Morning Call (San Francisco, November 18, 1894), appears to be a simplified sketch of the face that appears on the later, Coote production poster. 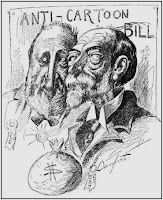 The poster from Bert Coote’s production several years later has a similar layout and design as the political cartoon of September 22, 1894 and is consistent with the poster described in the humor piece that appeared in Washington Times in December 1894. It seems likely that Charles Frohman would have commissioned an advertising poster to advertise opening night and that the poster would have been based on Willis Searle, if anyone. Weedon Grossmith does not seem to have been a red-head. Several photographs of Grossmith in character as The New Boy and a tinted or colorized print from the book, Players of the Day (1902) show him with dark hair, a long face and a hang-dog expression. None of the images of Grossmith in the role show him mugging for the camera with the wide, silly grin that was important enough to the American production to have been featured in its advertising poster and photographs of Powers in the role. Since Powers was a red-head and Coote looks as though he might be a red-head and since the original advertising poster shows a freckled person consistent with the trademark face described in the newspaper as a “red-headed urchin” – it seems possible that Frohman envisioned a funny-looking red-head in the role, and may have hired actors who fit the desired look to fill the part. Of course, if anyone ever finds a poster for the London production we may find out that the image originated in England. Alfred E. Neuman is the heir to the largely forgotten comic legacy of Arthur Law play, The New Boy, Charles Frohman’s genius for promotion, the actors' gifts of comedic expression, and the poster artist’s talent in capturing the mood of the play. The facial expression, the boyish man with the missing teeth, big ears and grin, and the devil-may-care catch phrase all combined to capture the popular imagination and fueled a never-ending succession of imitators – culminating in the creation of Alfred E. Neuman. Big-eared kids featured prominently in several pre-1894 cartoons fuel speculation that those earlier images may have been the original spark for Alfred E. Neuman. Who knows, perhaps some of those earlier cartoon images informed popular comedic tastes and inspired the expression. Perhaps Powers’ gargoyle face had even inspired some of those earlier cartoons; he was a friend of Thomas Nast and was well-known for his rubber-faced expressions. In any case, the earlier cartoon images generally show a big-eared head on a body within an entire scene. They do not show just the head and shoulders from a frontal perspective with a missing teeth, Eton collar and catch phrase, details determined by the plot of The New Boy and first seen in the advertising image created for The New Boy. The New Boy advertising image immediately went fin-de-siecle viral, or at least as viral as the technology of the day would permit. It was featured in political cartoons within days of opening night and in pop-culture parody within months. The image was copied, almost exactly, by the Atmore’s pie advertisements in 1895. 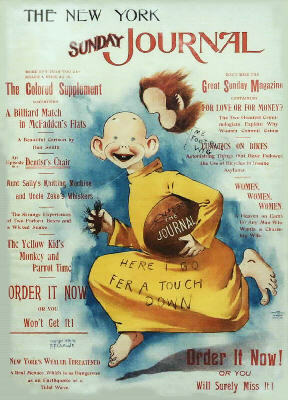 It may also have inspired the look of the late-19th Century comic character, the Yellow Kid. 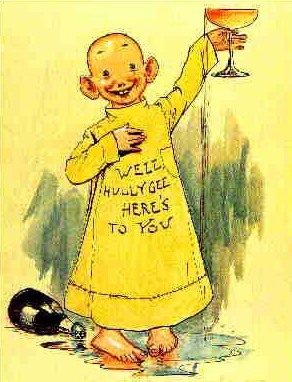 R. F. Outcault’s Yellow Kid cartoon character was pop-culture phenomenon that appeared in New York newspapers between 1895 and 1898. It was an early cross-marketing success, licensed to advertise shoes, tobacco, toys, books and magazines among other things. The Yellow Kid, whose face bears some of the hallmarks of Alfred E. Neuman, has previously been suggested as a possible pre-cursor to Alfred E. Neuman. According the a website maintained by the Outcault Society, the first three appearances of a character that looked and dressed like the Yellow Kid appeared in Truth Magazine in June, July and September 1894, before The New Boy’s opening night. Those images, however, look nothing like Alfred E. Neuman and bear little resemblance to the Yellow Kid cartoons that fueled Yellow Kid-mania. Those early images showed a bald child with big ears and an over-sized shirt, like the later Yellow Kid images. They did not, however, show the kid from the frontal view with the outward-extending big ears, silly grin, dimples and gap-teeth (well, there are only two teeth) that give him a bit of an Alfred E. Neuman look. Those later images did not appear in print until 1895 at the earliest. It is therefore more likely that The New Boy advertising image inspired the Yellow Kid’s make-over and propelled it to greater levels of popularity than the other way around. It seems that the Yellow Kid is one more comic empire that can thank The New Boy for its trademark look and for some of its success. 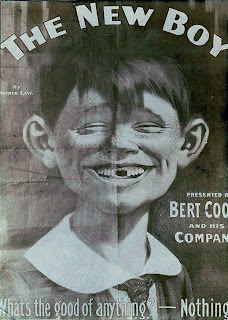 The painless dentistry ads appeared on the scene less than eight years after The New Boy first toured the entire country and within about two years of the end of Bert Coote’s production of The New Boy. James T. Powers was still a big star who received regular mention in the press, frequently toured the country, and whose photograph regularly appeared in books, magazines and newspapers. It was a time when millions of people had recently seen the “New Boy” posters, and many people may still have associated the “it didn’t hurt a bit” face with the show or with it biggest stars James T. Powers. The only two color versions of show red hair, a detail that is not readily apparent from the monochromatic sketches. Clearly, the ‘painless’ dentistry ads were lifted directly from or modeled on The New Boy advertising images, and not from anti-Irish cartoon art. One of the strangest images from this period, reproduced in Reidelbach’s Completely Mad, an image that appears to be the face from The New Boy poster “appears mysteriously as a garden faun” in a photograph, dated 1902 and printed from a glass negative found in the basement of a house in Takoma Park, Maryland. The photograph shows what looks like a family group posing on cut logs in a garden or yard with the larger-than life, ghostly head of the ‘New Boy’ peering over their shoulders from behind a hedge. Remember The New Boy posters that were posted in Washington DC? Takoma Park, Maryland is right next door to Washington DC, so the people in that photograph would have had access to those posters just a few years before the photograph was taken. Of course, 1902 is also about the time that the image started appearing in the painless dentistry advertisements, so it is possible that they borrowed the image from a neighborhood dentist who may have used it as an advertising sign for his dental practice. In any case, the random appearance of an early Alfred E. Neuman-like face in a garden in Takoma Park, Maryland may not be as random or surprising as it seemed when the negative was found. Another version of the image that appeared around the same time is associated with a musical comedy entitled Maloney’s Wedding Day. The Maloney’s Wedding Day image, which includes all of the familiar elements of the original (ears, teeth, hair, wide collar), appeared on sheet music, programs, and newspaper advertisements. The show appears to have started in about 1898 and played in various locations, mostly in smaller markets in the West, for several years. There may be a good reason that the show did not hit any major markets; the reviewer for the The Bemidji Daily Pioneer (June 10, 1910), suggested that Maloney’s Wedding Day was actually a renamed (and likely unlicensed) version of the earlier, better-known work, McKenna’s Flirtation. It seems fitting that a rip-off show would use a rip-off poster. The Maloney’s Wedding image was also, fittingly, ripped off for use in dental advertising. A photograph reproduced in Reidelbach’s Completely Mad, shows the Maloney’s Wedding Day character, with sailor’s suit and distinctive striped bow tie, on an advertisement posted in front of an itinerant dentist’s wagon in California gold mining country in 1902. The next wave of imitators were the “What Me? Worry?” kids, beginning in about 1910. Although the face and expression may have changed a bit, most of the original features are still intact: the coat and tie, the ears, a missing tooth, the silly grin and lazy eyes. While it is impossible to look into the hearts of the artists and/or advertising men who created and perpetuated the what-me-worry image, it seems likely that working artists of a certain age would have seen The New Boy, its poster or its advertising images at some point in their lives. They may even have remembered the poster and its catch phrase. It strains the imagination to believe that the artists who created these images would have independently paired an image so similar in almost every detail with original The New Boy image with a slogan so strikingly similar to the original The New Boy slogan without having been aware, either consciously or sub-consciously, of the original. Although the painless dentistry ads of the early 1900s may have kept the image alive, the pairing of the image with the slogan seems too coincidental to be, well, a coincidence. The modification of the original catch phrase to "Me - Worry?" seems to have been prompted by the "I should worry!" craze of the early 1910s, as I discuss in another posting, What? Me Worry? Isch ka Bibble and Alfred E. Neuman. Of course, the faces of the what-me-worry kids are not identical with The New Boy’s face. Although the manner of dress, the pose, the teeth, ears and expression are similar, the face is not necessarily identical. Was the change inspired by the Alfred E. Neuman look-alike and New Boy actor James T. Powers or by the artist’s funny looking brother-in-law? I do not know. Although it may be theoretically possible that anti-Irish cartoon imagery from the 1870s and 1880s might have influenced these changes, my inclination is to disagree. It was the Atmore’s pie ad, the political cartoons and the painless dentistry advertisements that perpetuated the image; not to mention the original The New Boy poster itself and the three tours over five years that distributed the image everywhere. You be the judge. It is also interesting that Alfred E. Neuman is a red-head like The New Boy and James T. Powers. The what-me-worry kids are not generally represented in color and are not clearly red-heads. Is it a case of great minds thinking alike? Is it that the face just looks like a funny-looking red-head? Were the artists at Mad Magazine more familiar with The New Boy or James T. Powers than they let on? We may never know. What we do know, however, is that the pose, dress, expression, general facial characteristics and accompanying slogan were all crystallized in the advertising image for The New Boy. It does not take a physiologist or physiognomist to judge whether and how much the later images retain the distinctive characteristics of the original. The eyes, eyebrows, nose, mouth and two-part, rhetorical catch phrase all strongly suggest that Alfred E. Neuman reflects the features, pose and expression of the original The New Boy poster and perhaps of The New Boy’s biggest star, James T. Powers. The conclusion is unavoidable; Archibald ‘New Boy’ Rennick (or perhaps James T. Powers) is Alfred E. Neuman’s grandfather if not Alfred E. Neuman himself. Great background. Have wondered for more than half a century what was the origin of Alfred's genealogical make-up. Great research. My father, who passed away last year (2015) at the age of 96, contended that Alfred E. Nueman was drawn after the face of a fictional character named Randy Mergatroyd. Don't know where he got that from. Also...neumann means new man. New man... new kid. Could this be an earlier version? Or at least a prototype? No missing tooth and no open smile. Or is that just a typical depiction of a London street urchin?